Although I fully understand the critique of the wider impact of selective education systems, a perspective I have is that, when I worked at a highly selective grammar school for several years, I saw forms of teaching that I had rarely seen before and I’ve rarely seen since. It remains the case the many of the best lessons I have ever seen were at that school. The key ingredients in those lessons were very simple: confidence and high expectations. In that undoubtedly privileged context, teachers developed habits around high challenge, high trust and high intellectual demand that were fully embedded in the culture. Now, in my work as an education consultant and teacher trainer, one of the areas I am asked to support schools with most often is “stretch and challenge”. In some schools, particularly mixed comprehensives working hard to raise standards on multiple fronts, it can be difficult for teachers to balance supporting students who struggle with learning as well as stretching more confident learners as fully as they would like. This can be seen in student outcomes or through an evaluation of students’ overall curriculum experience. There are lots of important debates in this area around the role of setting and labelling that I won’t go into extensively here but something I believe strongly is that, if selection is wrong, we need to do our best to match the learning experience high-achieving students might get in a selective environment in whatever else we do. Most schools dropped the loaded phrase “gifted and talented” long ago and are increasingly adopting the language of “high prior attainers” instead of “more able” to describe their “top end”. In an inclusive school, it is important to avoid language that reinforces a sense that high attainment is inevitable for some students and out of reach for others; that students’ paths are fixed. At the same time, there is a recognition that, unless an appropriate curriculum and appropriate approaches to teaching are put in place, it is possible for students to coast and underachieve. It is certainly my experience that children can be under-challenged all too often. 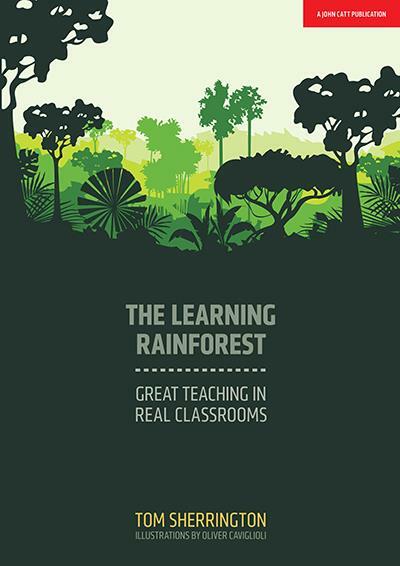 In my book, The Learning Rainforest, I explore this area in detail. One of my strongest convictions is that the best approach to differentiation in a classroom is to adopt a “teach to the top” approach; it’s a total philosophy that should inform everything you do. In my training I suggest that there are broadly three aspects to addressing the “stretch and challenge” challenge. To a great extent, this is the key to it all. Unless teachers have the belief that students can tackle difficult challenges, cope with a demanding load of independent study and can be expected to deliver excellent work week-in, week-out, then it probably won’t happen. Pushing the boundaries or “taking the lid off”, as I like to put it, doesn’t always come naturally and it’s important for teachers to try hard to find out what students are capable of if they are given the chance to fly. The place to start is in planning the curriculum, at the short-term level as well as in the bigger picture. Teachers should heed the call to “pitch it up”. This means selecting challenging texts, setting audacious levels of challenge in certain tasks and, crucially, eliminating any easy, gentle, simplified tasks that high attainers are not challenged by. It is important to have excellent subject knowledge and to focus on extending your own knowledge where needed so you can provide the challenge needed. Start year 7 with a bang, not a gentle introduction; make it clear that students will get plenty of work and that it is expected to be done with rigour, accuracy, flair and in depth from the very beginning. As I describe in my book, I’ll always remember my son’s first science homework: after reading about Democritus’s ideas about particles, “atoma”, the question was: “What is the difference between science and philosophy?” This was a joy to see. Not some lame cover page labelling the safety apparatus! Teachers can make a massive difference to how they teach for stretch for challenge every single lesson: through the questions they ask, the extent to which they probe for better, deeper responses, the expectations they establish in terms of work habits, depth of written answers, expectations of recall and independent thought and, more generally, establishing a classroom culture where intellectual activity is celebrated; embedded, not icing on the cake. Day-to-day, teaching for stretch and challenge is largely about conducting the core business of teaching at a consistently high standard; it’s not about doing anything special – just doing the simple things very well with a degree of drive and intensity. The beauty of this is that, if expectations are pitched high for the top end around responding to questions, knowledge retrieval, rigour and accuracy in the work students are set, then everyone else benefits too. As part of a rich curriculum experience, there are numerous learning activities that students can engage in that develop their knowledge and understanding while also giving them the chance to develop wider personal dispositions and skills. The trick is to plan them for maximum impact, keeping them in balance with the core flow of teacher instruction; always extending their knowledge while allowing them to explore the possibilities. Open-ended projects allowing students to make choices about their direction of study and the form of the products used to communicate their findings. Various “flipped learning” activities that require students to engage in pre-reading and research prior to exploring ideas in class. Debates and other extended oracy activities that require students to construct arguments and extend their knowledge. Deep-end problem-solving and extended writing activities with reduced levels of scaffolded support. Co-construction of the curriculum, harnessing students’ ideas for what to study and giving them the chance to deliver teaching inputs, showing their understanding and developing the skills of leading learning conversations. Well-structured collaborative projects that give students real responsibility for extending the scope of their study and working with others to put ideas into action – my son’s GCSE media film-making project was a great example of this. Blending these three areas together, I often suggest that it pays dividends to identify the handful of highest attaining students in any class and then to plan learning sequences around them, ensuring they are never under-challenged, seeking feedback from them about their experience as you go along. If those students are continually stretched and enjoy the learning process, everyone wins.